The histological and molecular characterizations of lung tumors are the basis for most lung cancer current treatments. Furthermore, lung cancer molecular changes are being used as molecular targets and predictive biomarkers for patient’s selection for targeted therapy, particularly, for non-small cell lung carcinomas. Lung adenocarcinomas, especially from nonsmoker patients, harbor mutations of EGFR and translocation EML4-ALK genes, which are targetable genetic abnormalities. Invasive SCC frequently has multiple genetic abnormalities, including activation of several oncogenes such as the fibroblast growth factor receptor-1 (FGFR1) gene amplification and the discoidin domain-containing receptor-2 (DDR2) gene mutation, which are promising molecular target genes. For small-cell lung carcinoma, the targeted treatment options are limited, and new targeted pathways are being investigated. For the most accurate molecular characterization of lung cancer, it is critical to sample and analyze tumors at each time point of clinical decision-making. 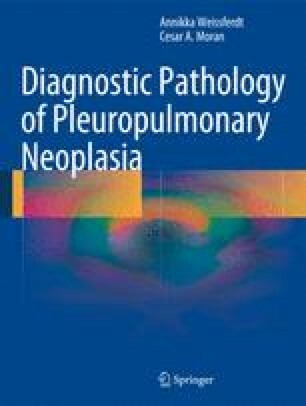 New emerging methodologies applied to tissue and cytology specimens have improved significantly the identification of molecular abnormalities in lung cancer tumors and, importantly, are being applied in molecular pathology diagnostic field.